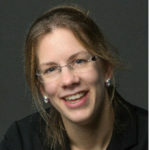 Fleur van Dijk combines research and patient care since she commenced her training in clinical genetics in July 2006. She studied clinical and genetic aspects of hereditary connective tissue disorders, especially Osteogenesis Imperfecta (OI). This research led to the discovery of a new genetic cause of OI in 2009 and other publications focusing on the genetic cause and clinical aspects of OI. In 2010 she wrote a publication together with (inter)national experts in the field of OI on the molecular diagnosis of OI (Best Practice Guidelines). In 2012 she started to work as clinical geneticist and post-doctoral investigator. Together with an international research group, she identified a new X-linked cause of osteoporosis and fractures, which was published in October 2013 in New England Journal of Medicine. Since 2013 she is part of the multidisciplinary expert team treating adults with OI in the Netherlands. In 2015 she accepted a position as lead of the national diagnostic EDS service in London which combines research and patient care for people with monogenetic types of Ehlers Danlos syndrome, a group of connective tissue disorders closely related to OI.